On a standard guitar, like the Fender Strat mentioned above, or the cigar box guitar in the photo below, it is said to be fretted on a chromatic scale. We are not going to get into the theory behind what that means here, but just take away this tidbit: a chromatic scale, like on a standard guitar, allows you to play every note you could possibly need for a song. All of the sharps, “natural” notes and flats. It’s all in there, and if you aren’t sure of what you are doing it is pretty easy to hit a sharp or a flat when you don’t mean to, causing potentially jarring discordance. The trade-off is that a chromatically fretted instrument gives you the most options when playing – you can play any song in any key (as long as you know where to put your fingers). It’s harder to play, but it puts all of the musical options at your fingertips. Literally. Note in the photo of the cigar box guitar above, how the frets proceed up the neck towards the guitar body, with a slightly smaller space between each one. This is a chromatic fretboard, and it can be used to play pretty much any song in any key. There are various other fretting layouts that have been used throughout the history of stringed instruments, but the most common variation to the chromatic style discussed above, is based on what is called the diatonic scale. This style of fretting is sometimes called “dulcimer fretting” because it is most frequently seen on dulcimer-style instruments. Basically, in diatonic fretting the sharps and flats are left out, leaving only natural or “whole” notes. Think of the “DO RE MI” scale that kids learn. That is the diatonic scale, just the key notes of the scale with no sharp or flats in there to bung things up. Check out the frets on the American Canjo Company canjo above. Notice how there are wider gaps between some of the frets, than there were on the chromatic fretboard above? That is because some of the frets have been left out – the frets that would have allowed the sharp and flat notes to be played. The result is a fretboard that allows you to play DO-RE-MI-FA-SO-LA-TI-DO as you move up the neck one fret at a time. 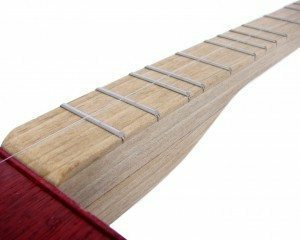 Using a diatonic fretting style can make it a lot easier to play basic songs, since there are less frets (and therefore notes) to choose from. The downside is that you are pretty much playing in one or two keys, and if the song you are playing happens to include a sharp or flat note that is not in the basic scale, you just won’t find it on your fretboard. The graphic above gives you a side-by-side comparison of chromatic and diatonic fretboards of the same scale length. As you can see, on the diatonic fretboard some of the frets have been left out. We’ll discuss the dashed line frets (#10 and #22) below. So here it is in a nutshell: to create a diatonic (dulcimer) fretboard, just start with a chromatic fretting template and leave out these frets: 1, 3, 6, 8, (10), 13, 15, 18, 20, (22). It lets you add a blues-style note to your songs, which can be a nice effect that gives you that immediately recognizable bluesy feel. Having this “blue note” in the scale is necessary to play a number of popular songs. It is certainly not used in the majority of popular songs, but it is used in a cool and important minority. On a more technical note, it lets you play in two different keys on the same instrument. Not to get too involved, but if you start your “do re mi” scale with the open (unfretted) string, and go up the fretboard (skipping the blue note), that is one key. If instead you start at the THIRD fret, and go up the scale, playing the blue note but skipping the one after it), that is a different key. So if your instrument had one string and that string was tuned to the key of “C”, starting at the third fret would be the key of “F”. So just by adding two extra frets, at the 10th and 22nd positions, you can effectively double the versatility of an instrument. On the downside, having that blue note on there does give you one more potential wrong note to hit, and the fact that it is not in the major “do re mi” scale of the instrument means that if you do hit it by accident, it will sound more discordant than the other notes on the instrument. If you are uncertain whether or not to include the blue note frets, a good plan would be to not put them on your first build. Get used to playing the instrument with the diatonic fretting. If you feel you want to take your playing a little further, then build another one (or add the extra frets to your existing one, and go from there. Hopefully this has given you a good idea of what diatonic/dulcimer fretting is, and why you might use it. To put it most simply, diatonic fretting makes an instrument easier to play, but less versatile overall. If you were building for an experienced musician used to guitars, you probably wouldn’t want to give them one with diatonic fretting. But if you are building an instrument for folks who don’t know how to play, or for kids, or elders, or just the general public who want to be able to quickly pick out a tune, diatonic can be a good option. Marker dots are there to indicate a change in octave. On a standard guitar they are placed on frets 3-5-7-9-12-15-17-19-21-24. It will not be possible to get them all, as one of the frets is omitted between Chromatic and Diatonic. For the others, simply compare the fretboard on your dulcimer with that of a chromatic instrument and copy over. There are no rules here, so you can also put them where you will find the most use out of them. I have the fret slots cut. What I meant is the fret markers which I intend to do with mother of pearl dots. This will depend on your scale length. We have a free Fret Spacing Calculator right here on the site. It will allow you to enter what scale length you desire and where each fret will be, including which frets to leave out for Diatonic Fretting. C. B. Gitty also has a number of templates that can help make this process even easier. I am building my first dulcimer with diatonic scale with 17 frets. Where should fret markers be placed? There does appear to be an error in the spreadsheet that we are working to fix. The blue notes are located at the 11th and 23rd frets in this case. Sorry for the confusion! Anyway go on with amazing site ! How about releasing a bass canjo and or diddley bow? Something with a 27-30 inch scale? Hi, extremely useful article. Just a quick question, the dotted line at 5 1/2 is the “mythical” extra 6 1/2 fret people have been adding to dulcimers for some time now? Thanks again. Pingback: Daily Tip: What is a Diatonic Scale? Absolutely, especially on 3-stringers. These sort of guitars are often called “Strummers” or the like, because they are based on the (trademarked) “Strumstick” invented by Bob McNally back in the early 80’s. It is a 3-string, diatonically fretted instrument that was one of the early forerunners of the homemade/handmade music movement. Oh my GOSH! This is SO helpful!! I just finished building a dulcimer (helping my daughter with her Appalachian Music Class). I was wondering why “Ti” was sounding so flat…. It’s a blasted blue note!! Once I started it at the 3rd fret, it was right on. I triple checked the fretboard before actually cutting… Could not figure out why that one note was so flat. Makes perfect sense now. Thanks so much for the enlightenment! Often the bridge is the bottom/back of the can, though more advanced methods are possible. The vibrating length of the string is always what determines the scale length, but yes when the can bottom is the bridge it is measured from there to the nut. The total length of ours are usually 28 inches though that can vary depending on the style. Not knowing anything about the canjo and reading your article above, has me interested. So you stated the scale length is 24.5″. So my question is, does a canjo have a bridge? or what is the bridge on it? Is it the end of the can that creates the bridge? And the distance of that end to the nut is your scale? How long is is a Canjo? Thanks for your time. Thanks Ray K, P.S. Thanks for posting the new song tabs for CBG’s. Diatonic fretting can be used with pretty much any scale length. The scale length of the canjo shown in the article photo is fretted to a 24.5 inch scale. The scale of the chromatically fretted cigar box guitar is 25″. The scale of the instrument in the first photo is about 21″. I cannot remember what the scale is of the side-by-side chromatic/diatonic diagrams. I meant the article above (diatonic Dulcimer-style ) fretting. We’d need a little more specifics as to which article you mean Joanne. What is the length of the dulcimer fretboard in Glen’s article?